Monsanto Agricultural Nigeria Limited has applied to the National Biosafety Management Agency (NABMA) for the environmental release and placing in the market in Zaria and surrounding towns of GM cotton (Bt cotton, event MON 15985). A further application isfor the confined field trial (CFT) of two GM maize varieties (NK603 and stacked event MON 89034 x NK603) in multiple locations in Nigeria. The groups are urging the Nigerian government to reject Monsanto’s applications out of hand.They note with disquiet that there is a serious lack of capacity within Nigeria to adequately control and monitor the human and environmental risks of GM crops and glyphosate. 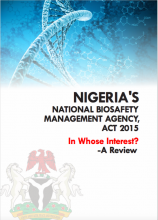 Further there is virtually no testing of any food material and products in Nigeria for glyphosate or other pesticide residues, or the monitoring of their impact on the environment including water resources.